Iraqi President Barham Salih on Monday said that President Donald Trump did not request permission from the Iraqi government to leave stationed U.S. troops in the country for the purpose of monitoring neighboring Iran. 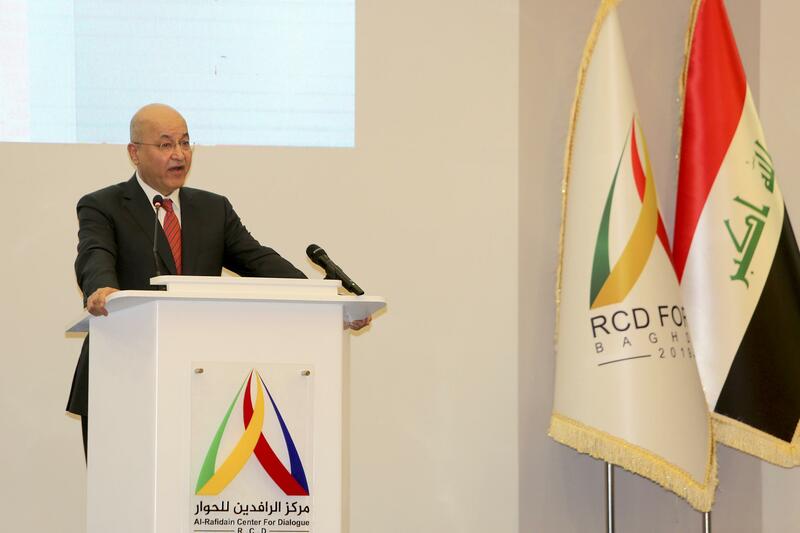 Salih, speaking at an international forum in Baghdad, cautioned Trump against putting his own country's foreign policy agenda over Iraq's, stating that Trump should not "pursue your own policy priorities." "Don’t overburden Iraq with your own issues," Salih said. "The U.S. is a major power...but do not pursue your own policy priorities, we live here." Salih also emphasized Iraq’s own primary political concerns, emphasizing the "fundamental interest for Iraq to have good relations with Iran." Salih’s comments came hours after Trump appeared on CBS' "Face the Nation" claiming troops were in Iraq to keep tabs on Iran. Trump, who has called Iran a top U.S. security threat, backed out of the 2015 Iran nuclear deal in May while reinstituting economic sanctions that had been lifted as part of the deal. "All I want to do is be able to watch," Trump told "Face the Nation" anchor Margaret Brennan. "We have an unbelievable and expensive military base built in Iraq. It's perfectly situated for looking at all over different parts of the troubled Middle East rather than pulling up. And this is what a lot of people don't understand. We're going to keep watching and we're going to keep seeing and if there's trouble, if somebody is looking to do nuclear weapons or other things, we're going to know it before they do." When asked by Brennan if he trusted the intelligence given to him, Trump said that he would disagree with reports if they claimed Iran was a "wonderful kindergarten." A number of senior intelligence officers have spoken out against the president’s military and defense tactics. A report in Time last week cited anonymous officials who decried the president’s "willful ignorance" and his inclination to contradict positions he previously and publicly condoned. This is not the first time the Iraqi government has expressed an unwillingness to host an estimated 5,200 American troops. Since late last year, Iraqi lawmakers have been working on legislation which would allow them to expel U.S. forces from their country, which is meant to solve what they have deemed "the ongoing American [violation] of Iraqi sovereignty."